The USA Kilts "PV Mini Kilt" is Kelly’s creation. 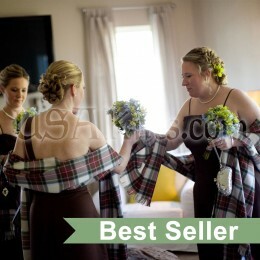 She wanted to make a modern fashionable tartan kilt for women, while keeping some of the aspects of a traditional kilt. We have roughly 70 PV (Poly Viscose material) tartans available. The Poly Viscose (65% / 35%) tartan material we use is an 11 - 12 oz. machine washable fabric. It is woven in the U.K. and has a combination of Low Pill™ technology and a Teflon® finish applied. This means that you won't get those little "pills" that form on fabric over months of wear and that even if you spill something on your kilt, it's easily wiped off. 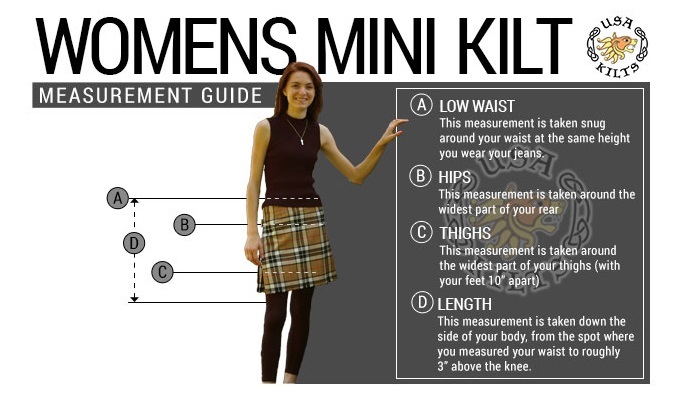 The mini kilts are worn lower on the hips and have between 10 and 24 pleats (approximately 1.25" wide). They are shorter than a man’s kilt with an average length of 16 inches from the 'jeans waist'. They close with Velcro on the inside left hip and 2 straps and buckles on the outside right hip. While there are no real rules about what tartans people are entitled to wear, if you are more comfortable wearing a universal tartan that was specifically designed for everyone, we’ve marked them as "Universal" in the tartan gallery. To see the available tartans, please click on the "Tartans" tab below this text. We would ask that you measure carefully for our kilts. 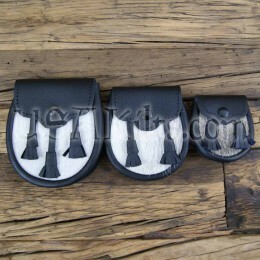 Since these are custom made to fit the measurements provided, you will need to be sure of the exact sizing. We will not refund in the case of mistakes in measuring. Detailed measuring instructions can be found in the "Measuring Instructions" tab below this text and a video on how to measure can be found in the "Videos" tab directly below the main product picture. 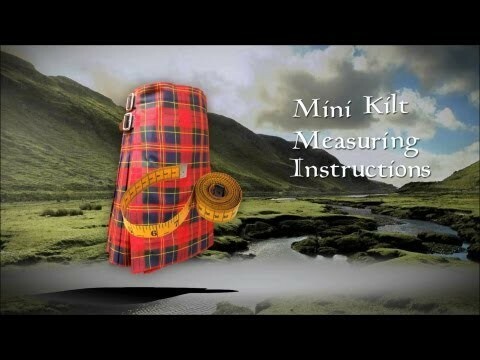 Our mini kilt is designed to be worn at "low waist" (where you wear your jeans). This is where the top of your kilt will sit. Just relax and stand "at ease". When measuring, the tape measure should be snug – as snug as you will be wearing the kilt. Use that measurement for the waist. Standing with feet about 8" to 10" apart, measure around the widest area of your thighs. Measure both thighs together, not individually. If you're 4' 8" to 5' 2", the length will be about 14" to 15.5. If you're 5' 3" to 5' 6", the length will be about 15" to 16.5". If you're 5' 7" to 5' 9", the length will be about 16" to 17". If you're 5' 10"; to 6', the length will be about 17" to 18.5". Master-crafted and custom fitted! Happy ! I have purchased two of these kilts - I came back for a second one because I was so impressed with the first one. My kilt is so well crafted, and a delight to wear. I am quite tall compared to what standard clothing sizes are, so custom made is a real necessity when I want to look sharp - and this is the kind of garment that is so good, it makes me stand even a little taller. When I look at the kilt I can see the high-level of craftsmanship found in a custom tailored suit: in how the fabric was cut, the matching of the plaid, the pleating, the stitching, and the finish work. When I wear it, the contours of the custom measurements, and how the weight of the fabric is perfectly matched to the style and length of the garment; when I move the swing of the pleats is just right. The PV fabric is easy to care for, and delightfully durable. This kilt is a very good value, as a life-time garment investment. Thank you USA Kilts - you rock! - Pleat width is 1.5" - 2"
- Selvedge edge is a tuck selvedge OR are hemmed if the selvedge is fringed. Our PV Mini Kilts are custom made and will take roughly 8 weeks to ship (unless the "Rush" option is selected).